HOW I LIVE NOW is a deeply odd film - half teen angst romance, half dystopian road movie. In the first half, precocious teen actress Saoirse Ronan (ATONEMENT) plays the rebellious American teen Daisy who is shipped by her uncaring father to stay with her country bumpkin cousins in England. At first, she's cool and aloof but is soon won over by their ramshackle charm - especially that of the brooding eldest son (and her first cousin) Edmond, played by George Mackay (SUNSHINE ON LEITH). The backdrop to this sunkissed coming-of-age summer is an impending war. What I really like is that because these kids are in the country, rather than in some sprawling urban metropolis, we're not seeing those standard shots of terrorist bombs in London. Rather, we're seeing fighter jets fly over head and small kids say, "wow, that's cool" before running off to a picnic. Once the war comes, the surrounding topsy-turviness allows Daisy and Edmond to have a taboo relationship and to commit, in their narcissistic teen angst, to make their way back to the farm if they are split up, which naturally they soon are. What then follows is a kind of road movie through wartorn Britain, where we see the standard, rather lazy shots of cars overturned on motorways, and troops rounding up civilians. There are hints at how the terrorists have brought England to its knees - and apparently much of Europe too - by poisoning the water supply, for instance. Each part of the movie worked well enough on its own terms. Ronan is a good enough actress to bring greater authenticity to the love story than the kids in TWILIGHT ever did. And I liked the hints and glimpses of the dystopian England and found them to be truly sinister. I even liked the fact that director Kevin Macdonald was allowing his heroine to be spiky and selfish rather than an instant maternal figure for her little cousin. But the two halves of the film just didn't cohere. And despite some strikingly gruesome visuals, I never felt the heroine was in genuine peril - or at least enough peril to make the final road movie genuinely thrilling. All in all, a rather disappointing film, then - bulging with interesting ideas but lacking in follow through. 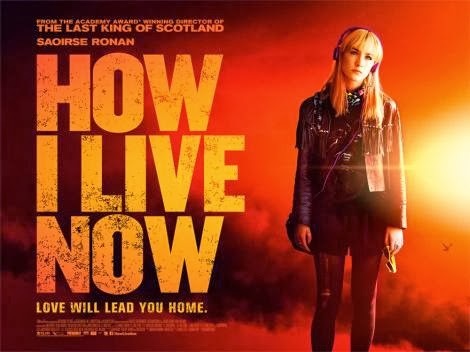 HOW I LIVE NOW has a running time of 101 minutes and is rated 15 in the UK. It played the Toronto Film Festival in 2013 and is currently on release in the UK, Ireland and Hungary. It will be released in the USA and Russia on November 8th, in Greece on November 14th and in France on February 19th.